Viking 75 med jämn värmealstring - Josef Davidssons Eftr. VIKING 75 is part of our new range of Austrian quality ranges, which take their place in a completely new room, the hypermodern kitchen, where cosiness is valued just as highly as quality, design and function. 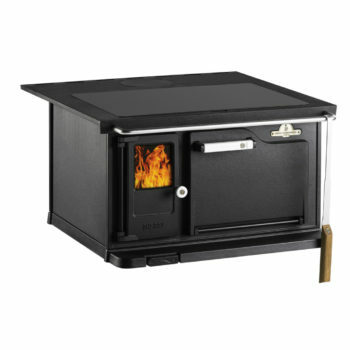 Viking 75, as the name implies, is a 75 cm wide wood burning range. It is a slightly larger model that provides an extra roomy oven with soapstone top and large hearth for quick and enjoyable cooking. The efficient and environmentally sound combustion technology means the maximum energy of the firewood can be extracted to provide uniform heating. The automatic intake-air damper regulates both the primary and the secondary air supply to give a more uniform temperature and a longer burn time. The maintenance is as easy as it is excellent – soot door, firewood box and ash box with cover are all easily accessible from the front. If the stove is supplemented with 5.5 or 10 cm convection sides, the Viking is approved for integration directly against flammable material. The standard height is 85 cm. For integration with 90 cm floor units, there is a base available. In the original design, Viking is delivered with a hardwearing steel hob above the range hob frame in cast iron. The entire hob functions as a hot plate. The loose hot plate can be removed to make room for a wok. For a more modern appearance, a glass ceramic hob is available as an option. The range can be connected to the flue at the rear, top or from the side. The flue pipe is also suitable for easy replacement with, for example, Husqvarna’s models 3026 and 3027.